The Student Code of Conduct is established to help maintain an environment conducive to learning and other educational pursuits. The Code is intended to ensure the enjoyment of students of all proper rights and to protect the mission, processes, resources and constituent community of Taft College. Students, faculty, staff and visitors to campus are expected to follow the Student Code of Conduct and federal and state laws. The Vice President of Student Services or a designated representative administers the disciplinary process governing students and visitors at Taft College. Specific disciplinary due process procedures and the regulations governing student conduct are followed for all conferences and hearings. College students are considered adults and are expected to assume adult responsibilities in planning and carrying out an educational program. It is of the utmost importance that students realize their responsibility to become efficient in the use of their time and develop an attitude of self-direction and self-reliance. The student’s responsibility to the college includes a proper standard of conduct at all student body activities both on and off campus. Failure to do so will be sufficient cause for dismissal from the college. 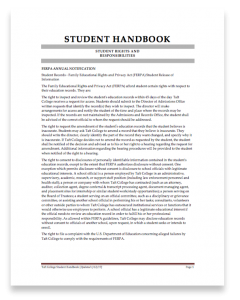 Student rights and responsibilities are outlined in the Student Handbook. Students who are dissatisfied are first encouraged to attempt to resolve the issue(s) by taking preliminary action and conferring with the person against who the student has the alleged complaint/grievance. If that proves impossible or unsatisfactory, the student can confer with the Vice President of Student Services, or designee. Students must complete a student complaint/grievance form to initiate the process. The Vice President of Student Services or designee reviews all complaint/grievance forms, and depending on the nature of the complaint, determines if the complaint is grievable. The Vice President of Student Services or designee, following established timelines, will either determine the disposition of the alleged complaint/grievance or refer it to the appropriate committee for review. Students have the right to further pursue their complaint via the California Community College Chancellor’s Office.